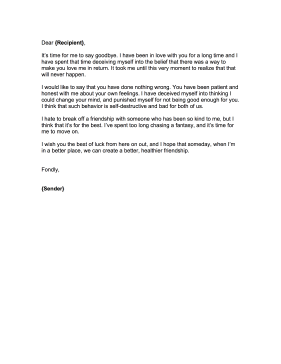 This romance goodbye letter cites unrequited love for a crush as the reason for the departure. It's time for me to say goodbye. I have been in love with you for a long time and I have spent that time deceiving myself into the belief that there was a way to make you love me in return. It took me until this very moment to realize that that will never happen. I would like to say that you have done nothing wrong. You have been patient and honest with me about your own feelings. I have deceived myself into thinking I could change your mind, and punished myself for not being good enough for you. I think that such behavior is self-destructive and bad for both of us. I hate to break off a friendship with someone who has been so kind to me, but I think that it's for the best. I've spent too long chasing a fantasy, and it's time for me to move on. I wish you the best of luck from here on out, and I hope that someday, when I'm in a better place, we can create a better, healthier friendship.